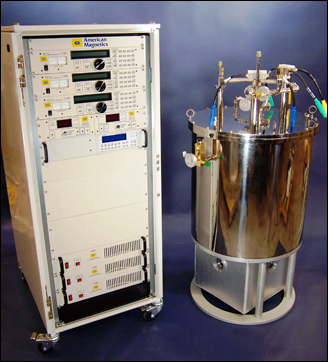 OptiMAxes TM systems provide variable magnetic field on the three principal axes and are particularly useful for orientation studies on a variety of samples for optical experiments. In light of the growing interest in spin-related phenomena and new generation devices for processing information, there is now renewed interest in the science and engineering of magnetic semiconductors. Magneto-optic studies provides an ideal means for studying properties of magnetic semiconductors and other materials where spin related phenomena are of paramount importance. The system is comprised of a 2 or 3-axis superconducting magnet, low helium consumption current leads, magnet dewar, optical windows, and associated electronics. Typical specifications include magnetic fields up to 4T for the principal vertical axis, 1.0 inch O.D. sample tube, and 1T rotating vector using any combination of x, y and z-axis magnets. It is also supplied with a variable temperature insert which operates from 1.5K to 300K.